Use our fun printable place cards in the classroom or home, to mark desks or make a party table look festive! Choose from many mixed sets or from pages with six of one animal per page, then just cut them out, fold them and stand. Each design offers a version with handwriting lines so that the little ones can get involved! Our first set of African animal place cards - we have two with 12 cute animals in total. They are perfect for cheering up a classroom, especially if you get the kids to write their own names on the cards and do the folding themselves. Print this mixed set of place cards decorated with the cutest African animals, and cheer up the tables in the classroom or the party tables! Cut the cards out and fold in half so that they stand with a tent fold. Our cute dinosaur place cards are perfect to print out for a dinosaur party, or to cheer up the classroom. Kids can write their own names using the handwriting lines, or you can write the names on the blank set. Here's a set of dinosaur place cards for older children. Write their names on the front, then cut them out and fold in half so they stand up like "tents". Perhaps the kids could write the name of the dinosaur pictured on the back of the cards? Simple, fun place cards to print with a smiley dolphin image, perfect for perking up a school desk! Make a tent fold and either write the child's name yourself or encourage them to write their own. Six printable place cards with a cute duck illustration, to perk up your classroom desks or party tables! Print, cut out and fold to stand. Here's a set of six mixed farm animal place cards, fun for the classroom or perhaps a party. Write the children's names on the front (or get them to write them with the help of the handwriting lines) and then fold to stand up. 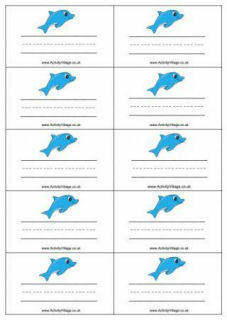 Six funny fish decorate this set of printable place cards - perfect for a swimming party perhaps? Six printable pig place cards to decorate the classroom or a birthday party! Write the child's name on the front and then fold so the card stands up like a tent. Here's a mixed set of six printable place cards with a sea creature theme, perfect for swimming parties or the classroom. They come with handwriting lines or without. There's scary sharks - and there are sharks which aren't scary at all. We've got the second kind! Print out these shark place cards and use them to mark places in the classroom - or perhaps at a swimming party? They stand up with a tent fold. A set of six printable place cards featuring a rather gorgeous sheep illustration, ready to cheer up your children's desks or perhaps act as place holders for a Farm Animal party. Stand up with tent folds. This smiley starfish illustration is sure to cheer up the child that sits at the place marked by these starfish place cards! Kids can write their own names with the handwriting guide lines, too. Six gorgeous teddies illustrate these printable place cards, which will cheer up a classroom or be useful for a teddy bear picnic or party! Write names on the front, cut out and fold.